The crew from Cal Trend came by our studio to show us how easy it is to install some of their velour seat covers. Cal Trend manufacturers custom seat covers for a lot of vehicles in a lot of different materials. You can check out the options on our website. 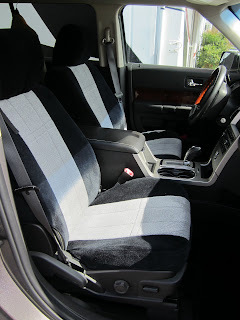 We ordered from velour seat covers for my 2010 Ford Flex for use in catalog photos. The first step is to remove the headrests so the top piece can be slipped over the seats. 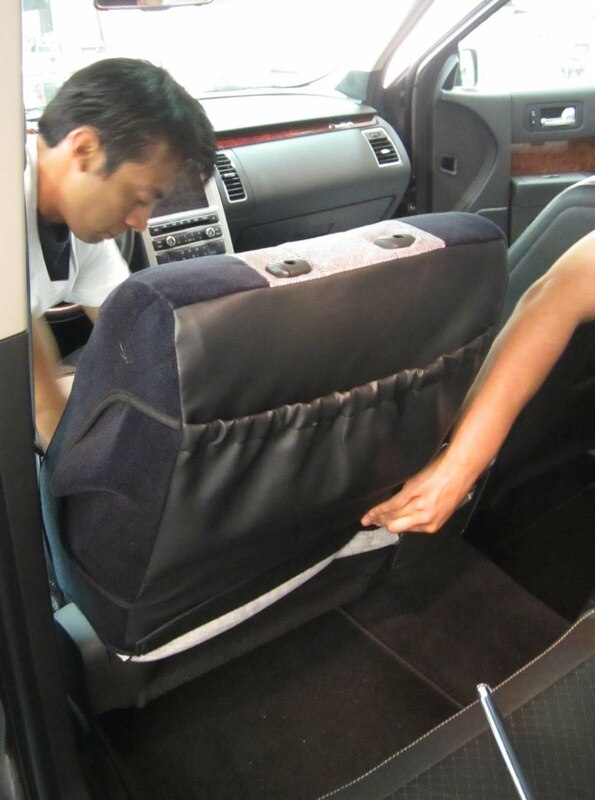 Once the cover is pulled all the way down, make sure any openings for armrests or side airbags are properly lined up. Next, the crew lined up the bottom seat cover. Simply slide the plastic tabs through the bottom of the seat back. Once the seat cover is tightly in place you can properly fit it to the seat. Notice the side? The seat cover material is custom fit for the seat, so the fabric is designed to be tucked inside the plastic frame of the seat. The nylon straps shown are attached to the front edge of the seat cover base. Those straps are run underneath the seat. They will be secured to the plastic loops from the top side. Please be careful on this step: Make sure that any wiring for the seat controls is not caught in the straps. Once the straps are passed under the seat, loop them through the plastic buckles to tighten. 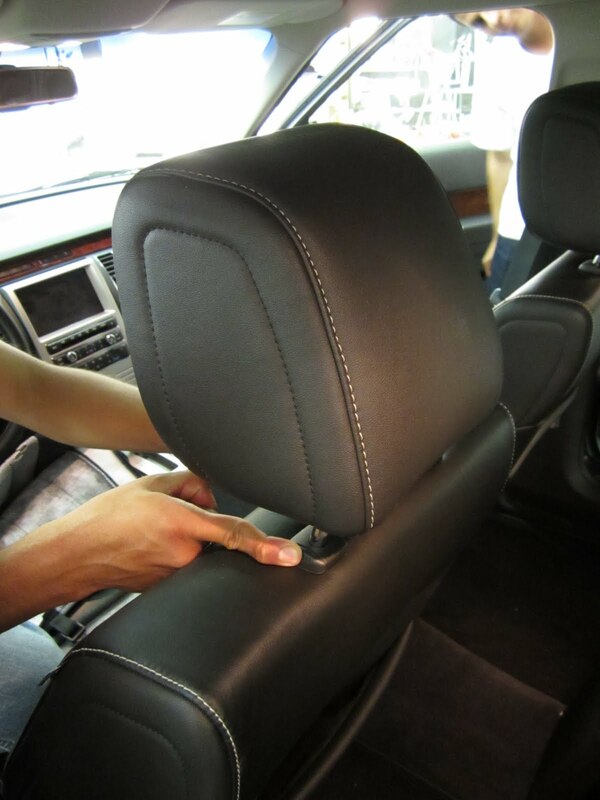 After the top and bottom are secure, slip the custom cover over the headrest. The installers recommend doing this before putting the headrest back on the seat. 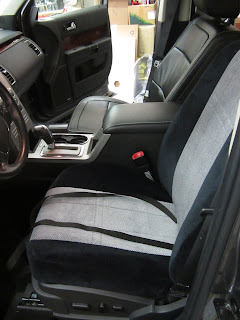 It is much easier to slip the headrest cover on if you rest it on your leg. The seat covers do come with detailed instructions on how to install bucket or bench seat covers. Here is how the front and back row seat covers look on the Flex. The installation takes about 30 minutes to complete. Thank you to the guys from Cal Trend for stopping by our studio to help us out. I recently picked up a 2010 Ford Flex Limited. I am going to cover the customization and detailing of the Flex on our blog page. I have not decided what I am going to do to it just yet, so this post involves the care and maintenance. Because I am always in and out of our photo studio with props and products, I had my friends at Cal Trend make up a set of custom velour seat covers. They make custom covers for every row in the Flex and only take about 30 min to install. 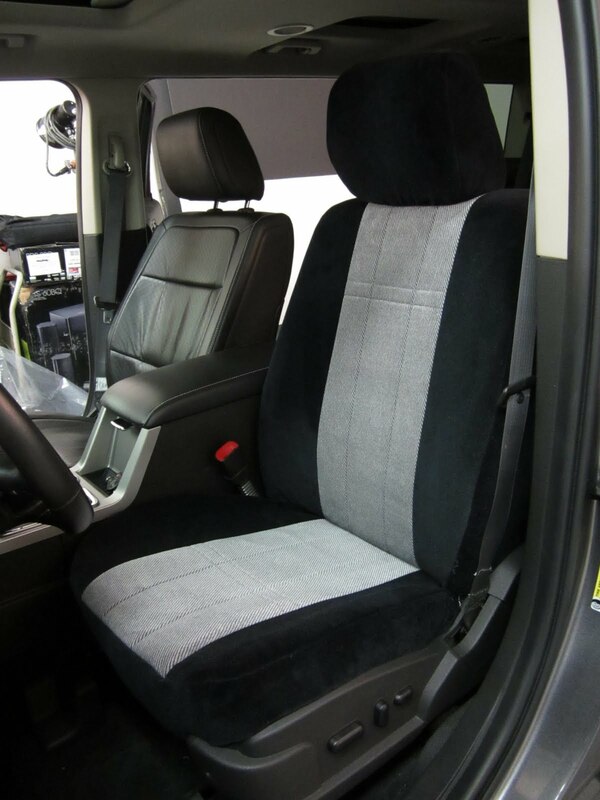 Seat Covers on our website. The custom sun shade is a must for the summer. It's well over 100 degrees all July and August in Southern California, so the rolling sun shade has been great at keeping my dash cool. I also had to get a custom cover when the Flex is not in the garage. I picked up a Superweave because it is lightweight and easy to care for. The normal Flex pattern does not have an antenna pocket, so I had my sewing dept add that on. Happen to see The Green Hornet? If not, check out the use of a California Car Cover in the movie. As Seth Rogen is pulling the cover off of the car you can see the CCC logo. The cover was used to unveil a classic car just before the new Black Beauty is revealed. Thank you to everyone at Columbia Pictures and Sony for using one of our custom car covers. 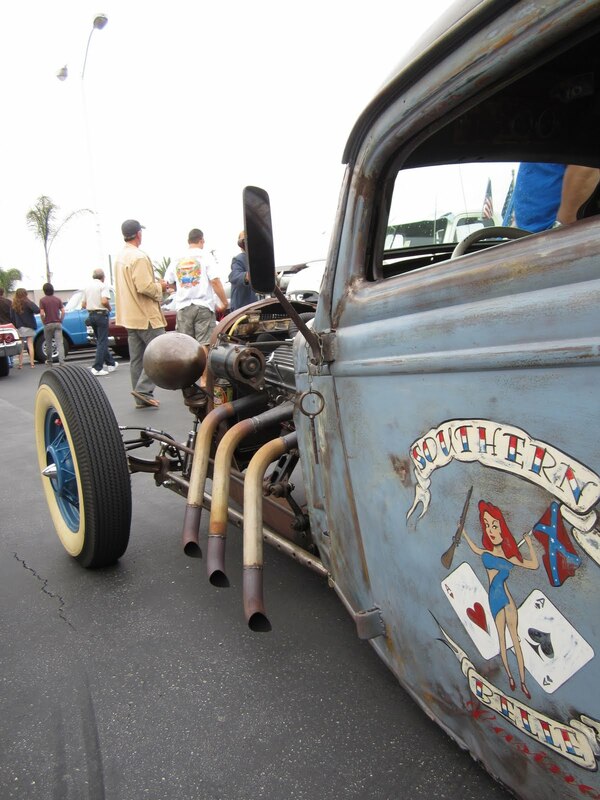 This Saturday, July 23rd, California Car Cover is the last stop on the 250 Loop Poker Run presented by Mad Ink Designs. The poker run starts at 8am in North Hollywood and ends at our facility around 4pm. You can get more details on the rules, stops and prizes on the Mad Ink website. Hope to see a lot of locals there. A Saturday morning institution in Orange County, Ca. The Donut Derelicts meet every weekend at a small coffee shop in Huntington Beach, Ca. My father has always been a fan of cruising over there on Saturdays for a hot tea and donut, so I joined him over the 4th of July weekend. There are plenty of cars that fill the parking lot every Saturday. Hundreds of classics and muscle cars stop by for just a few hours early in the morning. 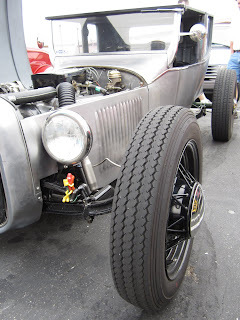 I am a fan of 60s Lincolns and Chevy Novas, so I had to take a few photos of these cars. This car was pretty unique. We were pretty happy to find that the owner had a California Car Cover and California Car Duster in the cargo space. Next time you are in Orange County, be sure to stop by the show. Just remember to get there early. For more information on where California Car Cover will be next, please visit our website.